The Electric Sam Slot by ELK Studios is a 243 ways to win video slot. You play here on five reels and three symbols with Electric Sam, Maggy and Sandra. All three characters have some surprises for you when you soin the reels. The Electric Sam Online Slot has a Free Spins feature and Sticky Wilds with the Electric Sam icon. Sandra increases your winnings with multipliers and Maggy implodes the symbols for a second win chance. Without a doubt, this ELK Studios slot offers some very interesting features! Symbols and payouts: Actually, the Electric Sam Slot belongs to the category Fruit Games. Lemons, cherries, melons and plums land on your reels. These are the low paying symbols. From a combination of 3 symbols, you win 10x your bet with these symbols. With 4 or 5 symbols next to each other you get 20x and 40x your bet. Also a bell symbol and a red 7 is present. The bells icon is your scatter symbol with no payouts. The red 7 is more valuable than the fruit symbols. Here you can grab winnings up to 80x your bet. The wild symbol is the Electric Sam symbol. Electric Sam Sticky Wilds: The Electric Sam symbol is not a simple wild symbol. As always, it replaces all symbols except the Free Spins symbol and has one more feature: when 3 or more Sam symbols land on your reels during Free Spins, he goes electric and replaces 1 Random symbol with a Sticky Wild. Maggy Imploding symbols: If you trigger the free spins feature with at least 3 scatter symbols, another feature comes into play. The Maggy symbol already pays up to 100x your bet in the base game. During the free spins she sets off a chain of imploding symbols. That means for you get another chance to win in the same game. 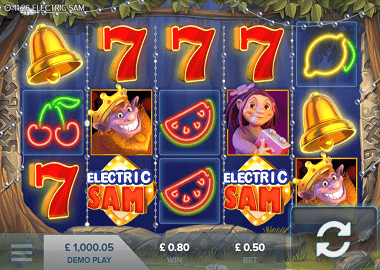 With all 3 bonus features (Sam, Sandra and Maggy) the free spins are particularly exciting and without any doubt the highlight of the Electric Sam slot machine. ELK Studios online slot machines are extremely popular among enthusiastic players. The games offer very nice and innovative bonus feature, are available on all platforms and have a super quality! You can easily launch the Electric Sam Slot on your Smart Phone within seconds. Play the slot here for free (click on the banner above) or test the slot in one of our recommended online casinos. There are some nice and of course lucrative bonus offers. For example, you can play 50 Free Spins on the Starburst online slot at Casino Luck or Next Casino!